Comeback Attempt: Stocks Seem Poised For Early Gains, But Can They Last? (Monday Market Open) After flirting with correction territory late last week, stocks look poised to post some early gains Monday. The question is whether any morning strength can last through the day, with the market still on pace for its worst month in almost a decade. Today isn’t scheduled to bring much in the way of milestone company reports, but this week is set to be one of the busiest of the earnings season (see more below). So far, 77% of companies have beaten Wall Street analysts earnings per share estimates, compared with the five-year average of 71%, according to FactSet. Also, 59% of companies have beaten on sales, in line with the five-year average. On the corporate front, International Business Machines (NYSE:) announced the $34 billion purchase of Red Hat (NYSE:) in a deal designed to enhance IBM’s cloud division. Recall that earlier this month, IBM reported slowing cloud sales in an report that many analysts saw as disappointing. Shares of IBM slumped to nine-year lows following the Red Hat announcement. All major indices finished last week with sharp losses. This week brings the end of this stomach-churning month, along with another full batch of earnings and data—including a and from Apple (NASDAQ:). Overnight saw another plunge in China’s stock market, but some positive traction in Europe. The closely watched clicked up slightly to 3.09%, but remains well under the month’s highs above 3.25%. One thing to consider keeping an eye on this week is the FAANGs. As we saw last week, action in these five stocks tends to boomerang around the market. When Amazon.com (NASDAQ:) and Alphabet (NASDAQ:, ) retreated last week, it helped drag the market with them. AAPL’s earnings later this week, scheduled for after the close Thursday, could loom large. Apple is arguably just the tip of the iceberg in a week that, when finished, will see the majority of earnings season completed. Other key company reports include Facebook (NASDAQ:), Coca-Cola (NYSE:), General Motors (NYSE:), Alibaba (NYSE:), Chevron (NYSE:) and Exxon Mobil (NYSE:). It might be a good idea to keep listening to company conference calls, because so far they’ve likely been behind some of the negative sentiment these last few weeks. Companies across many industries have been expressing concerns about a stronger , higher energy costs, and tariffs all taking a toll on current or future performance. United Parcel Service (NYSE:), Anheuser Busch (NYSE:) and Illinois Tool Works (NYSE:) were among the companies last week mentioning foreign currency struggles. That’s kind of what many analysts had feared going into earnings, and points up how even strong quarterly performance often isn’t enough to give stocks a boost if investors are fretting about the future. The dollar index rose intraday Friday above 96.80, near its yearly high, before retreating slightly. Many companies say foreign exchange has been and could continue to be a challenge. GM, KO and AAPL all could be interesting to hear on that aspect of things when they report, considering their large international businesses. CEO calls are more important than ever. So what we might be seeing here is a simple readjusting of expectations among many investors as these troubles start to hit earnings. It’s arguable that the fundamentals behind many stocks, including AMZN and GOOG, haven’t changed all that much. What does seem to be changing is the multiple some investors are willing to pay for those companies as they look down the road and perhaps see a little less opportunity for growth, especially considering all the outside fundamental issues mentioned above. Even companies with positive guidance see their stocks struggling, and those with negative guidance are getting hammered. Except for the late sell-off Wednesday, the downturn has mostly been orderly. There’s little panic selling. Instead, many investors seem to be selling a little and then sitting back to see what might happen next. This process could continue throughout earnings season. Also, every day has had a few green patches where certain sectors have shown a little strength. This could be seen as healthy. Still, volatility remains elevated and there’s little reason to expect that to change in the coming days. With that in mind, investors might want to consider trading small as long as they don’t mind increased trading costs. That means if someone normally trades 1,000 shares, they might want to consider trading 300 or 400 instead, at least while volatility continues to surge. Things are moving fast, and you don’t want to jump in front of a freight train. Also, people who trade using stops should consider widening those as long as volatility remains high. , the market’s most closely watched “fear index,” climbed above 26 Friday, well above the historic average of mid-teens. The new week promises a wealth of economic data, highlighted by Friday’s U.S. for October. Recall that in September, job growth of 134,000 was well below analysts’ estimates, but the unemployment rate fell to near 50-year lows and wages, while up, arguably stayed out of “overheated” territory. Investors awaiting the October data should keep in mind that any wage growth of more than the 2.8% year-over-year rate seen in September might fuel concerns about inflation and a possible hawkish Fed reaction. Even in light of the stock market selloff, futures prices indicate a nearly 65% chance of a before the end of the year. While that’s down from above 80% a few weeks ago, odds still seem pretty high that a fourth rate hike is in store. However, for a follow-up rate hike in March took a tumble last week and currently sit below 40%, from above 50% just a week ago, according to CME futures. The jobs report might give a sense of the inflation picture, but there’s nothing like actual inflation data for that, and investors get some Monday with (PCE) prices. The Fed looks very closely at these, so investors should consider doing the same. The data Monday for September showed a 0.1% increase in PCE prices, in line with analysts’ expectations. Core prices rose 0.2%, a little above the 0.1% that Wall Street had dialed in. in September rose 0.2%, below the 0.4% consensus estimate. FIGURE 1: FLIGHTS TO SAFETY? 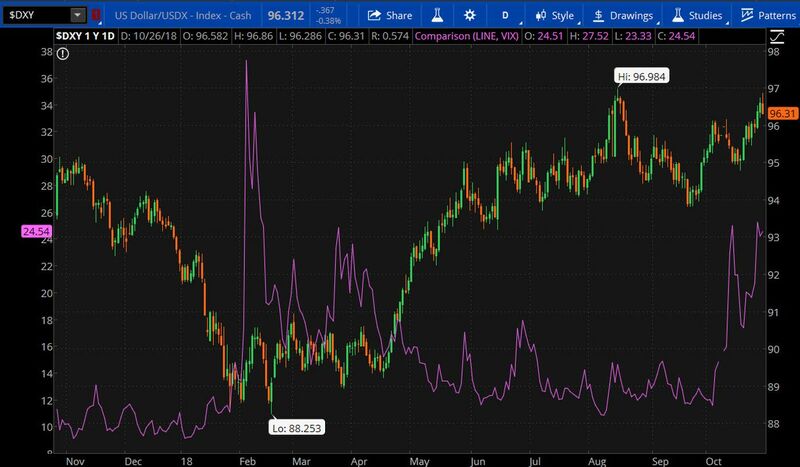 Though the U.S. Dollar Index (candle chart) sometimes sees strength during times of extreme market volatility (as shown by the Cboe Volatility Index—VIX—purple line), that’s not always the case. The two have moved in tandem, however, over the last round of October volatility. Image sources: Cboe Global Markets, ICE. Chart source: The thinkorswim® platform from TD Ameritrade. For illustrative purposes only. Past performance does not guarantee future results. Pulling Back the Curtain on Data: While headline data can provide a helpful snapshot, it often helps to dig under the main number to get a little more insight. Investors who did that with Friday’s key data— and Michigan —might have noticed there was more than meets the eye to both. For instance, even though the headline Q3 GDP growth of 3.5% beat analysts’ consensus of 3.3%, the report showed very slow growth of just 0.8% in company investment during the quarter, down from more than 11% in Q2. That could raise questions about whether companies see enough economic justification to re-invest in their businesses moving forward. Inventories grew, but could have reflected some companies loading up on goods ahead of time to beat looming tariffs on Chinese imports. Also, consumer spending rose sharply, perhaps due in part to the tax cut. Another really big growth area was government spending, which can stimulate the economy but by its very nature typically isn’t seen in the same light as consumer and company spending. Balance Beam: Often during the last two years, long-term investors heard that they should check allocations to make sure the rally hadn’t caused their portfolios to weight toward equities beyond their comfort levels. After all, if stocks get on the express elevator straight up, it’s likely that a portfolio would swell from those gains, raising the percentage devoted to stocks without an investor doing anything. Someone who wanted, say, 50% of a portfolio to be in stocks and 50% in fixed income, might suddenly find themselves at 60-40. The key is to take a look every quarter, or at mid-year, and calculate whether the percentages moved out of line. At that point, the investor could re-balance by weighting the portfolio back to the original comfort zone. This correction we’re in now might turn the tables a bit. At this point, with around half of S&P 500 stocks down 20% or more from their peaks and the and officially in correction, those losses might mean some investors aren’t weighted enough toward stocks. Long-term investors might want to take a look this weekend (if they can bear facing those losses), and make sure they’re still comfortable with the proportion of their portfolios dedicated to equities. It’s called rebalancing, and can be done when the market is going down or going up. Amazon Cruise: One interesting note about AMZN that stands in contrast to all the bearish stock movement Friday: Its quarterly earnings keep rising, and have been going steadily up now for about three years. It’s getting harder to remember the days when some investors dismissed AMZN as an all sales, no earnings story. Now many seem worried about the company’s revenue, especially slowing growth in its online retail sales, even as earnings grow and grow. The price-to-earnings ratio remains very high, but it’s no longer infinite, perhaps a sign that the company is evolving over time especially as it ventures into conceivably more profitable ventures like cloud computing and advertising.